Saturday at dusk Mom sat watching me when Mister, her yearling son, came towards her down their hill. His dad approached Mom, coming from the east. Mister burst towards them and the three had a rendezvous. Near the end of the video, Dad works to settle Mister down. A little after that Mom shows Mister some teeth and he drops onto his side: almost as if Mom shot him dead! These three, after the rendezvous, tried to cross under the bridge into the nature preserve. However they wouldn’t go under the bridge with me standing there. While waiting to pass, they began to yip, the upset kind. I left so they could continue on their way. Significantly, Mom and Dad were together without their new puppies. Are there new puppies this year? If so, were they at dusk Saturday unattended or being cared for by one or both of the other yearlings, Bold and Shy? If either alone or being cared for, where? I don’t know. Last year Mom and Dad raised their puppies without help. Last year when I saw puppies, Dad was with them. At times I saw Dad alone without either Mom or puppies. Seeing solitary Dad meant to me that Mom must have been with the puppies. This year there are too many full grown coyotes around to allow such guesswork. Yearlings may make life easier for Mom and Dad, but they make my life, though richer with coyotes, harder. This is a fabulous video!! The joy of the coyotes is absolutely infectious as I watch it! 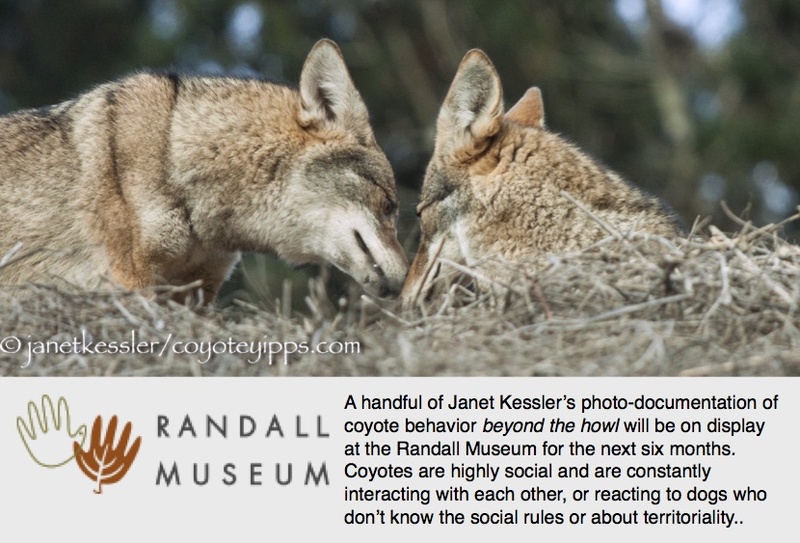 I notice that the first two coyotes are rather stiff as they first greet each other, almost cautiously, but then the younger guy comes bounding in, pell mell, with his joyous run and wiggly squiggles and kisses, and they all run off together with their tails whipping around like airplane propellers! Sometimes these greetings are silent, and sometimes they are accompanied by squeals of delight! Charles caught a superb scene! Interesting that the parents felt a need to calm down the younger fellow! Thank you Janet. In the video it looks like the two parents dropped their wariness to allow the joy as long as they moved farther away from me. After this they all returned to the original spot where Mom was sitting, they all urinated and scraped there, then continued on, where Dad’s shoulder fur was standing on end. Their average distance from me in this clip was about 200 feet and even from that distance they saw Holtz and me as a problem! I agree, infectious joy! I wonder how long that little fellow had been away from his parents; he certainly missed them…and especially liked the tails whipping around in circles, as if they were about to take off. Great video. I’m guessing, but he wasn’t all that far behind in time following Mom down the hill, five minutes max! Great site, would you happen to have a flikr account or some other place with the high res version of some of your photos?